Ashley's pregnancy was smooth and uneventful. There was no reason to suspect anything unusual about Cash's health. But soon after he was born, the Goeppert's realized he wasn't hitting his milestones. 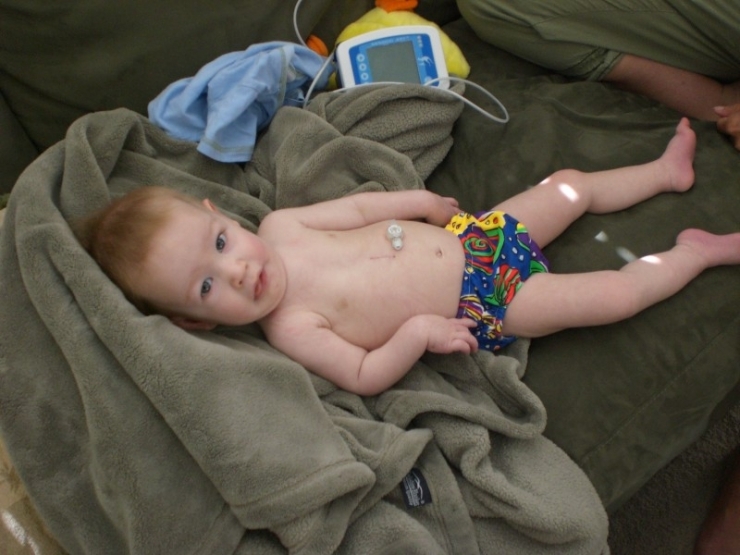 When Cash was 2 months old, his pediatrician conducted several tests. The neurologist eventually suspected a neuromuscular disease called Spinal Muscular Atrophy (SMA), but the results of the test would take 2 weeks. It was the longest 2 weeks of the Goeppert's lives. The day they were scheduled to get the results was another snowy day in March. Cameron dropped Ashley and Cash off at the front of the hospital so that Cash wouldn't get cold. He then parked the car. As he made his way into the office, he found Ashley on her knees in the lobby. She was crying uncontrollably. He knew what it meant. He bent down and held her. Through the tears, Ashley sobbed, "Our son has SMA." The prognosis was grim. Cash has SMA1, the worst kind. 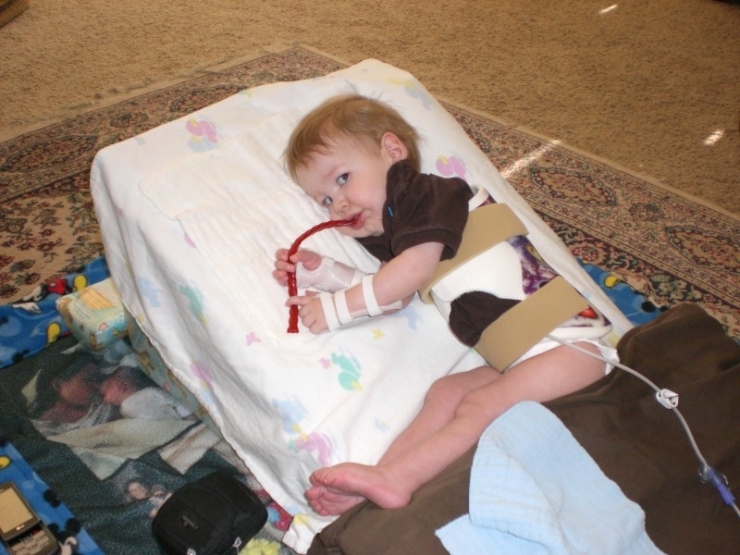 Infants with SMA1 have severely low muscle tone and never achieve the ability to sit independently. The neurologist didn't expect Cash to live past 6 months. "Take him home and make him comfortable." The Goeppert's refused to accept this. Cash would need round-the-clock care. He qualified for a nurse, but Ashley was already working as an RN and going to school for her Masters. 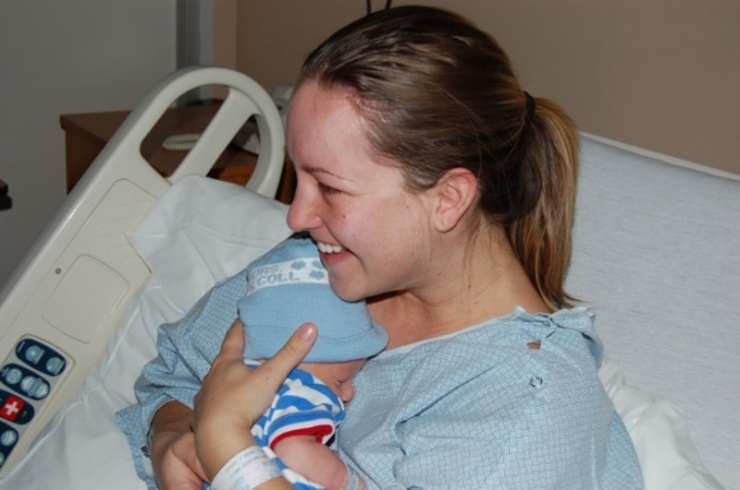 Cameron and Ashley agreed that the best person to take care of their son was his mother. Ashley quit her job to take care of Cash full time. 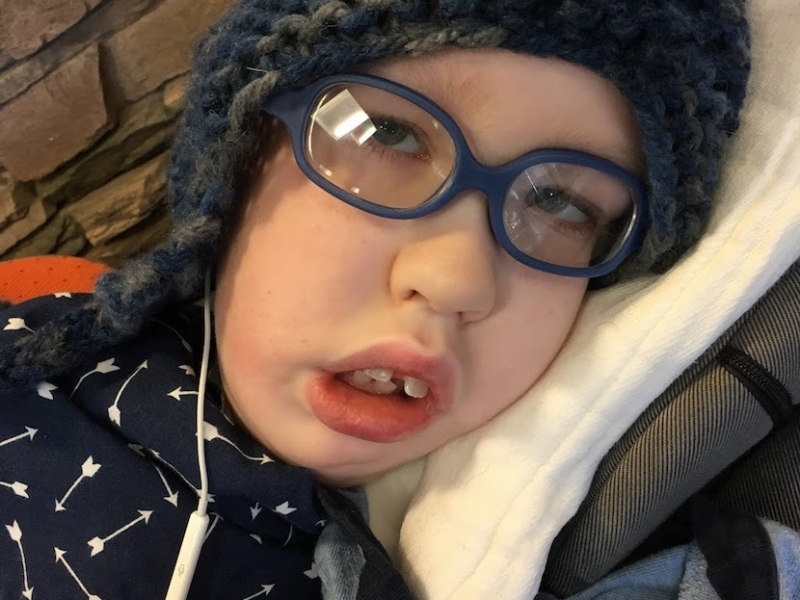 Our son might not move very well, may not breathe, eat, swallow, walk, stand, sit or hold his head up unassisted, but there is still a life to be lived. It wasn't easy. Cash is completely immobile. He has a feeding tube, trach, and ventilator. The first 2 years, there were many close calls. 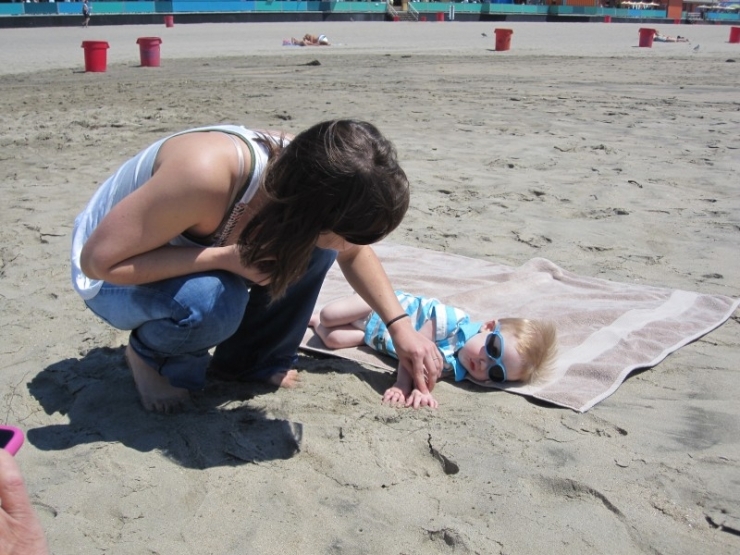 "We saw our son stop breathing and turn blue more times than I can count," Ashley recalls. There were so many incidents that the local fire department had a special supply bag on their ambulance set up just for Cash. 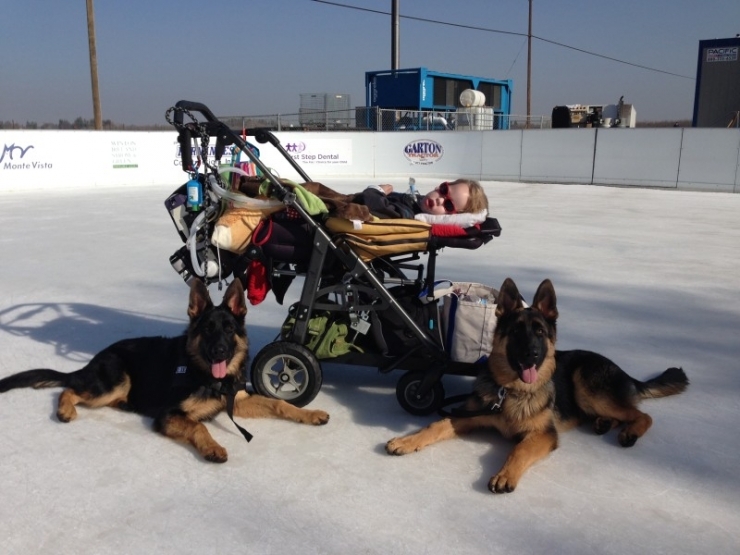 As the Goeppert's settled into their new normal, they didn't let Cash's limitations hold him back. 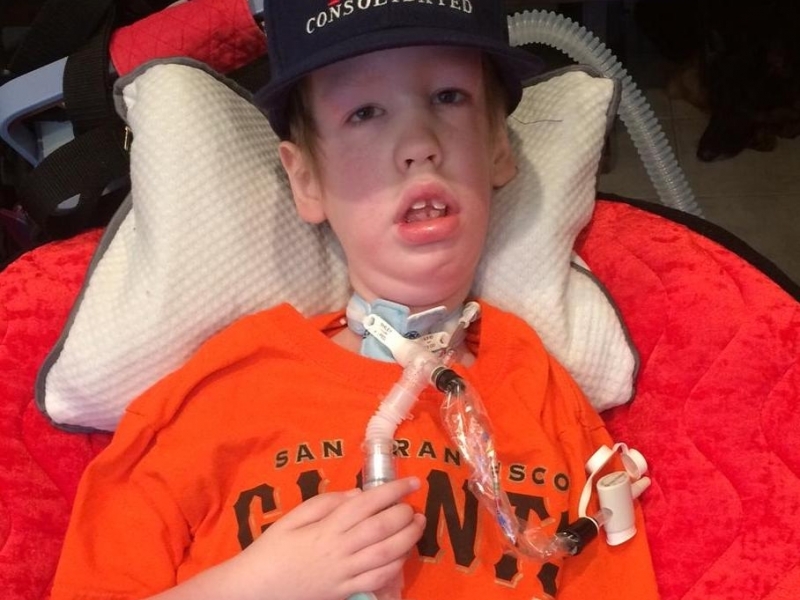 "Our son might not move very well, may not breathe, eat, swallow, walk, stand, sit or hold his head up unassisted, but there is still a life to be lived," Ashley declares. Perhaps the worst part about SMA is that it doesn't affect the brain. Imagine being entombed in your own body, aware of everything going on, but physically unable to interact. That has been Cash's reality every minute of his life. He is a typical kid trapped in a body that he can't use. Cash is now 4 years old. He has learned how to communicate using a special eye gaze device. He activates it with his eyes and a computerized voice speaks for him. For a kid who cannot move, he has quite an extensive list of hobbies. 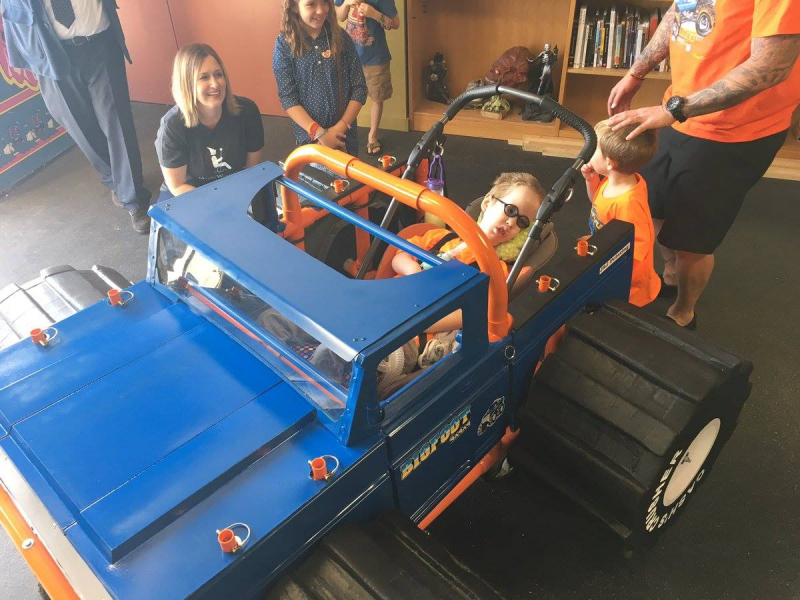 He likes playing computer games on his eye gaze device, going for walks, gardening, racing RC cars, art projects, and reading books. He loves to play with his German Shepherds or go swimming with his pet chickens. He's a social butterfly who loves to host guests and "party." Oh, and he also loves to look at theCHIVE with his dad. 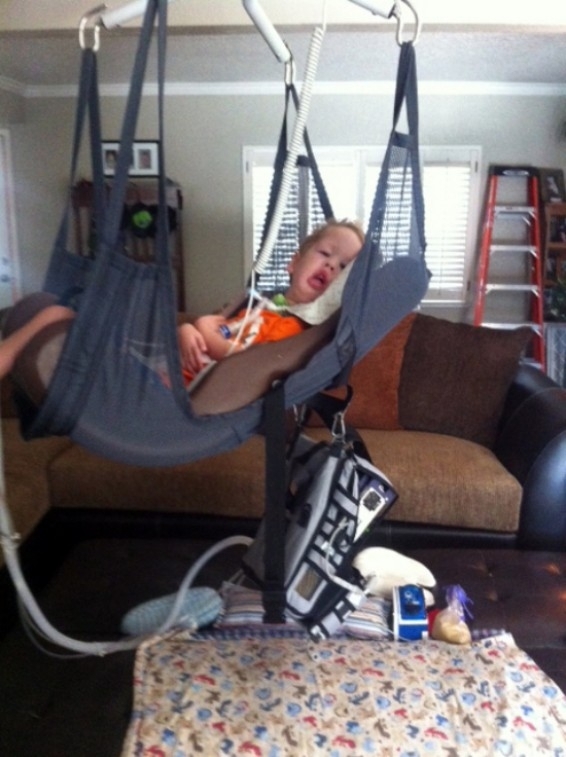 As Cash continues to grow, taking care of him is becoming more challenging for Ashley. Cash has outgrown the length of the tub, which makes bathing him a delicate, tricky dance. Children with SMA are known to have brittle bones. "I have to be careful when moving or even positioning him," Ashley explains. And he's only getting taller and heavier. This is where the Chivers step up to the plate. 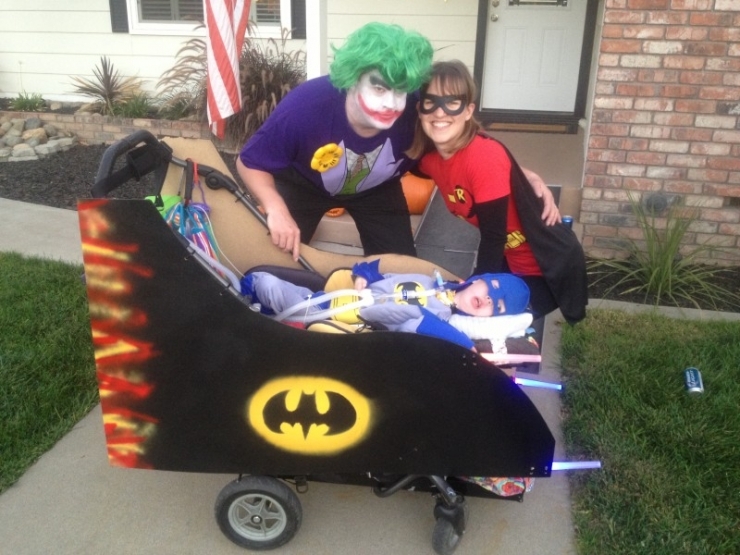 Thanks to your continued donations to the Chive Fund, Chive Charities is donating a $34,300 grant to Cash's family! The first thing the grant will go towards is a bathroom remodel that will make it easier for Ashley to bathe Cash. The second is a state-of-the-art overhead lift system. Ashley can hook up Cash and glide him from room to room. It's like a rollercoaster track all throughout the house. Cash has his own personal Disneyland and Ashley's back is getting a much-needed break. Cash is a quirky kid who loves balloons for some reason. 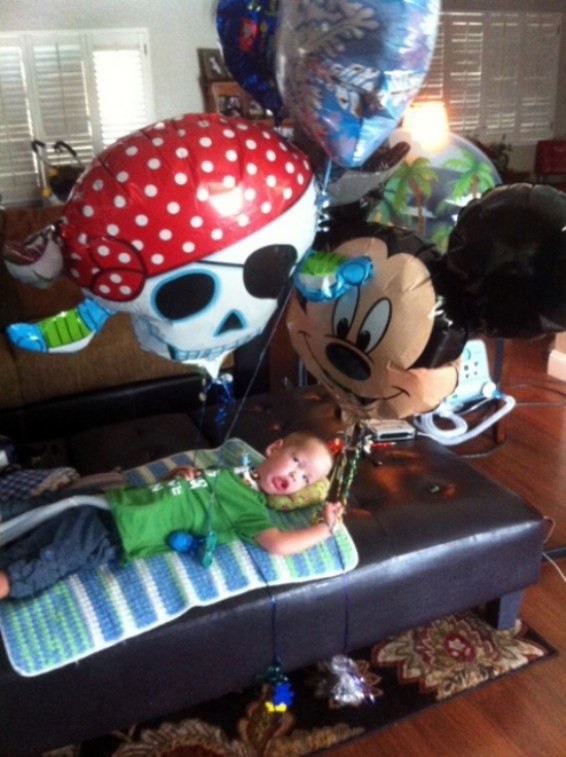 "He will not allow us to leave the store without letting him get a balloon," Ashley explains. Cash doesn't discriminate. He loves all kinds of balloons: graduation, anniversary, birthday... It doesn't matter to him. 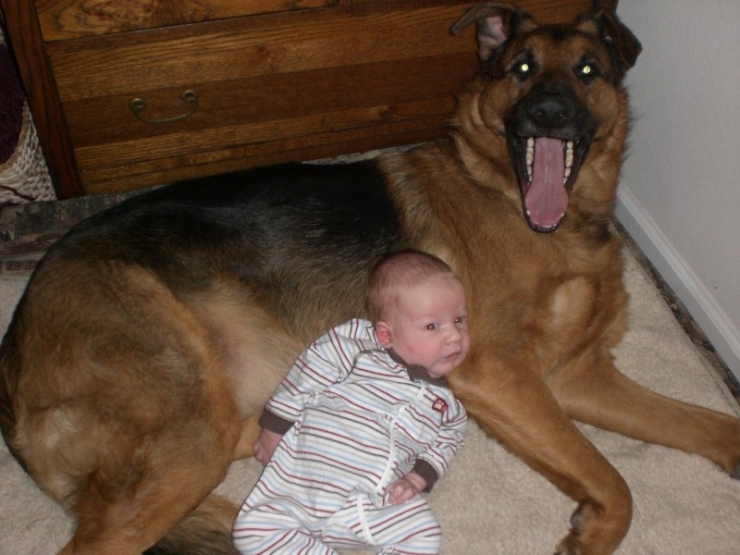 Cash is an animal lover who adores his pet German Shepherds. Kids with trachs aren't typically supposed to swim, but swimming is one of Cash's favorite things to do. 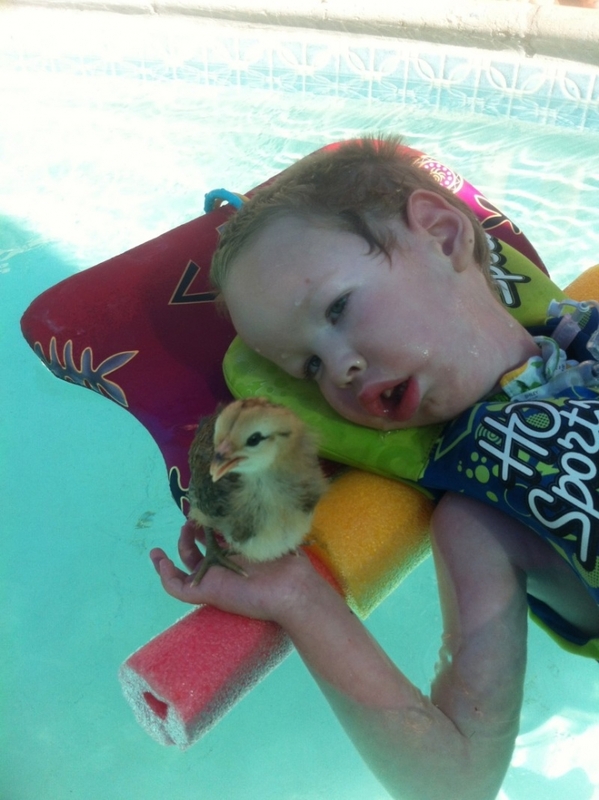 Here he is swimming with one of his pet chickens. 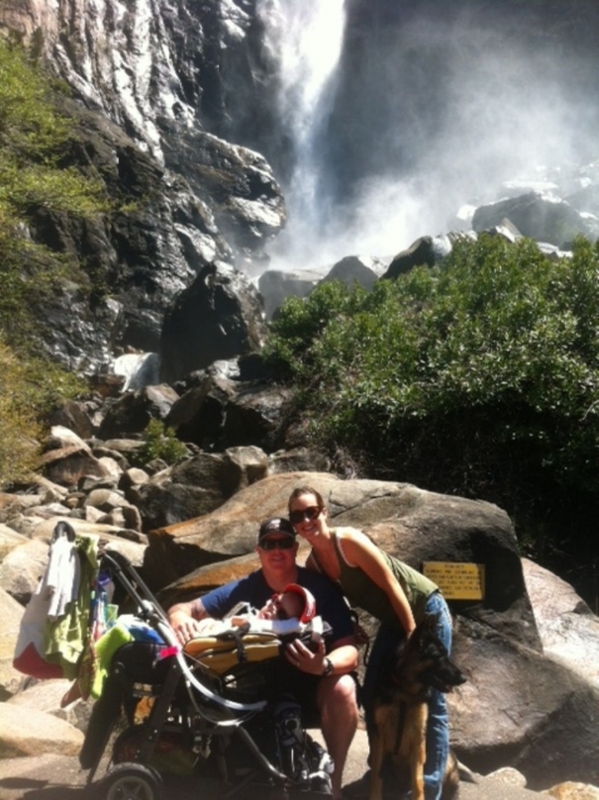 Cash dreamed of seeing a waterfall, so his parents pushed his 100+ lbs stroller up a hill in Yosemite National Park! Here's the state-of-the-art overhead lift system that we installed! When the Chivers come together, magical things happen. Your donations to theChive Fund continually make a significant difference in the lives of kids with rare medical illnesses. 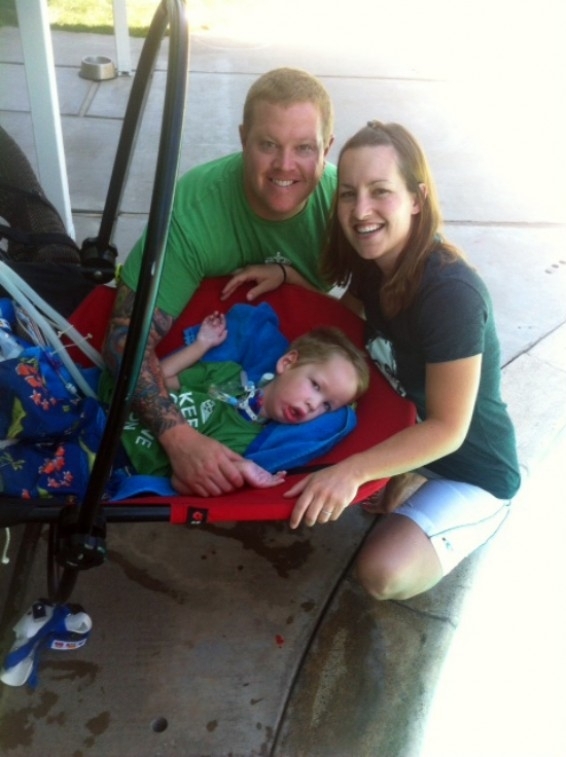 Cash is a happy kid, but transporting him became increasingly difficult for his mom. $34,300 later, you guys have alleviated Ashley of a great burden. Transporting him around the house is not only easy, but he has a blast gliding down the hallway. They said he'd only live 6 months, but Cash had other plans. If we've learned anything about this kid, Cash is a charismatic survivor and knows how to get his way. He is blessed to have loving, active parents who will go the necessary lengths to make his dreams come true. His health limitations aren't stopping him from living life to the fullest. In just 4 years, he has already achieved and seen so much. His life is an inspiration to us all.